The word ‘extreme’ is one that conjures images of sky-diving, bungee-jumping, moto-cross riders pulling off mega jumps and, for me at least, monster trucks. 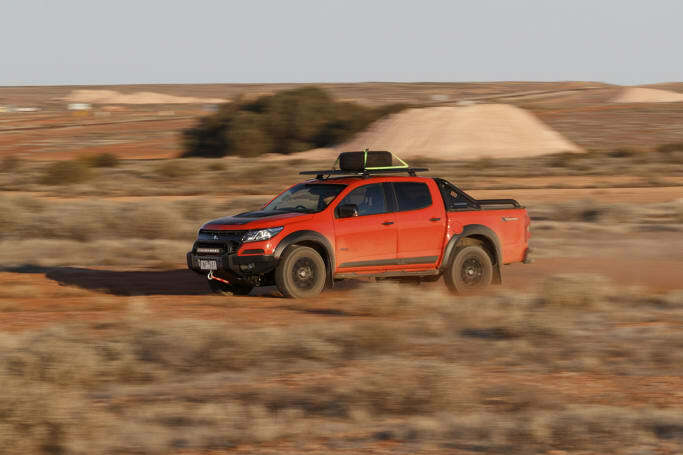 I guess there’s something to that, because this new Holden Colorado Z71 Xtreme is a bit of a monster truck - it’s essentially a beefed up and more hard-core version of the regular Colorado. 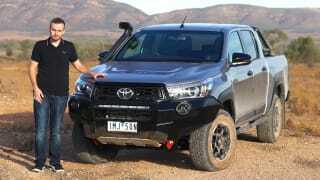 It builds upon the top-of-the-range dual-cab diesel four-wheel drive ute to make it, well, a bit more extreme. Here’s how it does that. 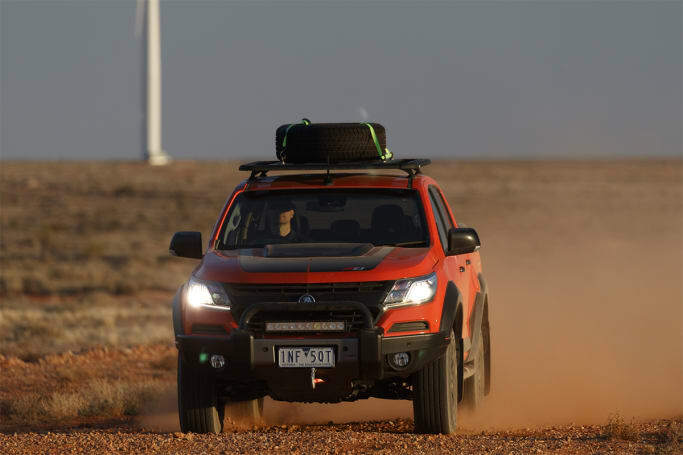 You could consider the Z71 Xtreme a response to the Toyota HiLux Rugged X model - it’s an off-road-focused model plastered with genuine accessories, but rather than being assembled at a dedicated local production line, as the Toyota is, Holden gets its dealers to fit the gear to each Z71 ute. It’s available through about 120 of Holden’s 180 or so dealers. There are a lot of additions, here - almost $20,000 worth, in fact - which helps explain the sizeable asking price for a new Z71 Xtreme. More on that below. Visual differences include a black grille, a bonnet bulge, a roof tray kit and fender flares. But as, er, eye-catching as the big stickers on the tailgate and hind quarters of the tray are, it mightn’t look quite as monster truckish as some buyers may want. 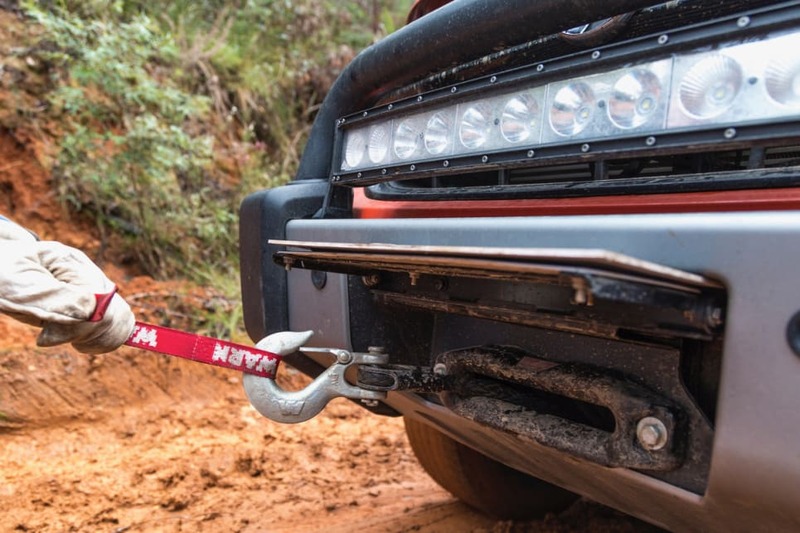 In terms of functional elements that change the form of the ute, at the front there’s a winch bar with an integrated 10,000 pound (4535-kilogram) winch and 30 metres of synthetic line (which, Holden is eager to point out, the army also uses, rather than steel rope), plus there’s an LED light bar - and the suspension at the front has been upgraded to cope with the extra mass. The uprated springs have been designed to mimic the regular model in terms of the trim of the vehicle, and can be had on any model with frontal protection (bull bar, safari bar, nudge bar or winch bar). At the front there’s a winch bar with an integrated 10,000 pound (4535-kilogram) winch. The winch comes with 30 metres of synthetic line. Further visual differentiators include a black grille and a bonnet bulge - we’ll get to what it's covering in a sec. Other changes include a roof tray kit, fender flares, tubular black side-steps, a heavy-duty steel rear-step and black sports bar (which, unlike those of some competitors, isn’t load rated), a soft tonneau cover and under there you’ll find a vehicle recovery kit, including a rated recovery tongue for the tow pack. At the back the Z71 Xtreme includes a towing pack with towbar and wiring, plus you get 18-inch wheels with Goodyear All Terrain Wrangler tyres. A bit like a tradie who has worked as hard on the job as he has at the pub, it is made for the rough stuff… but could be prettier. Inside, there’s an 8.0-inch touchscreen media system with Apple CarPlay and Android Auto. There’s good loose-item storage, including cup holders up front, bottle holders in all the doors, and a spacious second-row seat with a flip-down armrest hiding a pair of cup holders too. 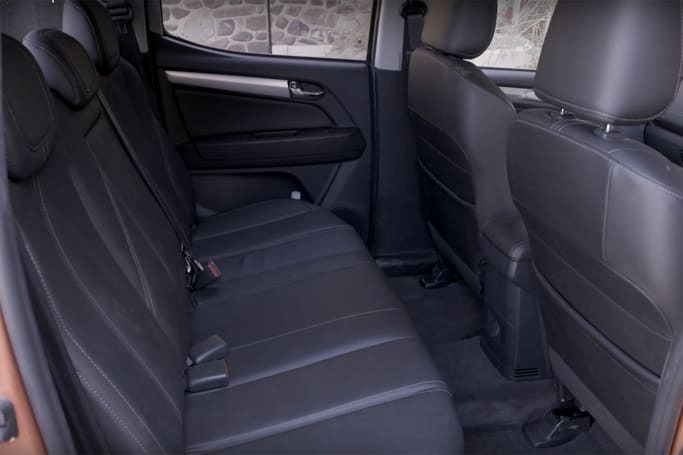 Compared with the likes of the Toyota HiLux, Nissan Navara, Mitsubishi Triton and Mercedes X-Class, the Colorado offers really decent back-seat space. The Colorado offers really decent back-seat space. It’s on par with the Isuzu D-Max and Ford Ranger for leg room and headroom, but can’t match the width on offer in the Volkswagen Amarok. The dimensions are marginally impacted by the bars front and rear, but not dramatically: the regular Colorado dual-cab measures 5361mm long (on a 3096mm wheelbase), 1872mm wide and 1800mm tall. The tray dimensions are unchanged, at 1484mm long, 1534mm wide (1122mm between the arches) and 466mm deep. 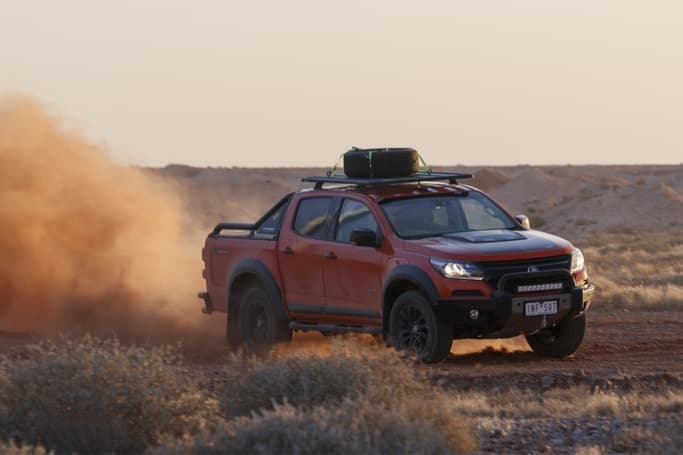 If you took the regular Holden Colorado Z71 model, which lists at $57,190 plus on-road costs for the six-speed auto, and added the $19,000-plus of options to it, you’d end up at $76,190 plus on-road costs. That makes the $69,990 drive-away price tag seem eminently more palatable, but it’s still kinda expensive, especially considering you could get yourself a pretty impressive VW Amarok V6 Sportline for about $55k drive-away, drive it to ARB, and get a lot of the goodies fitted to this truck for similar cash. As mentioned above, the HiLux Rugged X model - which lists at $63,990 - appears a bit better value, too. But in the Colorado Z71 you do get decent gear, such as leather trim, heated front seats, climate control air-conditioning, an auto-dimming rearview mirror, auto headlights, an 8.0-inch screen with smartphone mirroring and a reversing camera, 18-inch wheels and more. Plus it offers better payload capacity than the equivalent Toyota too. Being a MY19 model, there are two new colours - Orange Crush (new) and Dark Shadow (replaces Satin Steel). Being a MY19 model, there are two new colours - Orange Crush (new) and Dark Shadow (replaces Satin Steel), and there’s rear privacy glass - tinted windows weren’t offered on any grade until now. There’s a new key fob design with a push-to-turn barrel action, too. There are some nice safety items, too - read more below. The bonnet bulge is misleading, because the engine is the same. Despite quite a bit of extra weight being added to this version of the Colorado, there’s no power bump. It retains the existing 2.8-litre four-cylinder turbo-diesel ‘Duramax’ engine with outputs of 147kW of power and 500Nm of torque. Officially, the Xtreme is only available with the company’s six-speed automatic transmission, so it still gets class-leading torque for a four-cylinder. Towing capacity remains among the better ratings in the class, with a 750kg un-braked trailer and 3500kg braked towing capacity. 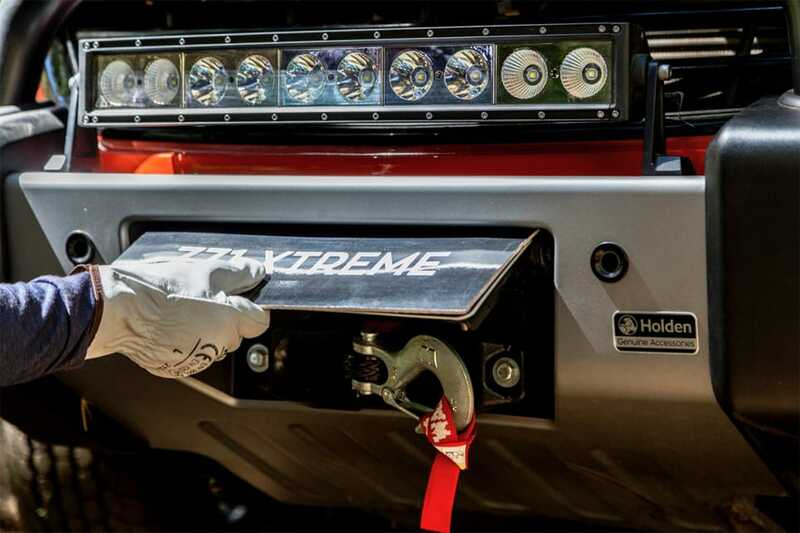 With about 150kg of extra weight fitted to the Xtreme model, the payload has copped a slight dent - Holden says the capability remains at about 850kg, which is still pretty strong considering the Rugged X version of the HiLux has 748kg. The gross vehicle mass (GVM) is rated at 3150kg, while the gross combined mass (GCM) is rated at 6000kg. According to Holden, the Xtreme model exhibits no difference to the fuel consumption figure of the Z71 dual-cab diesel auto 4x4 ute it’s based upon. That means a rating of 8.7 litres per 100 kilometres. On our drive - which consisted of 99 per cent high-speed travel on loose gravel - we saw a trip computer indicated 11.3L/100km. Fuel tank capacity is 76 litres, meaning a theoretical mileage range of 1145km if you can get the claimed consumption, or 860km at what we we saw. It’s pretty much identical to a Z71 Colorado to drive in normal everyday scenarios. That means it’s pretty decent, especially without anything in the tray. 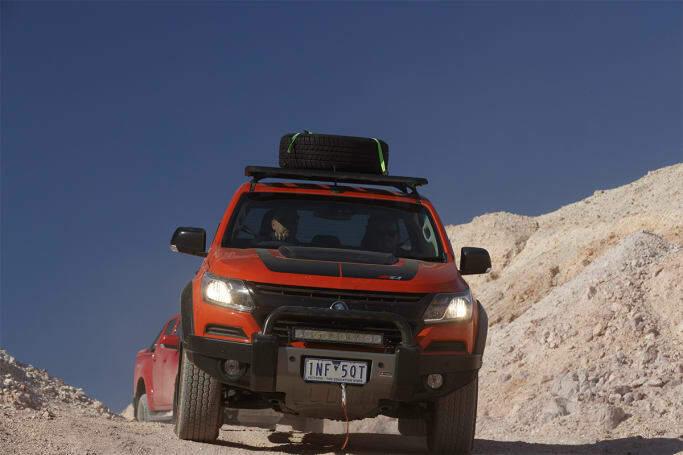 We did some limited driving in and around Coober Pedy, and while the traffic was hardly what you’d see in Sydney or Melbourne, it proved fine. The acceleration from the 2.8-litre engine is decent, though there’s just a bit of turbo lag to contend with down low in the rev range. The six-speed auto does a good job of keeping things moving, and responds quickly to sudden throttle inputs. The brakes pull up okay, but the pedal action is a little soft. The ride, though, is the most impressive element. With three adults on board and nothing in the tray, it was really well sorted over little lumps and bumps, without much jostling from the tray at all. The steering is a little slow at really low speeds, but reacts decently through roundabouts and the like. If you plan to cover hundreds of kilometres of loose gravel roads like we did, then the Holden Colorado Z71 Xtreme is a great option for you. While the ride impressed around town, it was even better over high-speed corrugations - there’s the usual vibration through the seats, which is a bit like a massage, but the way the suspension isolates the cabin from the jostling that the wheels are doing is really impressive. 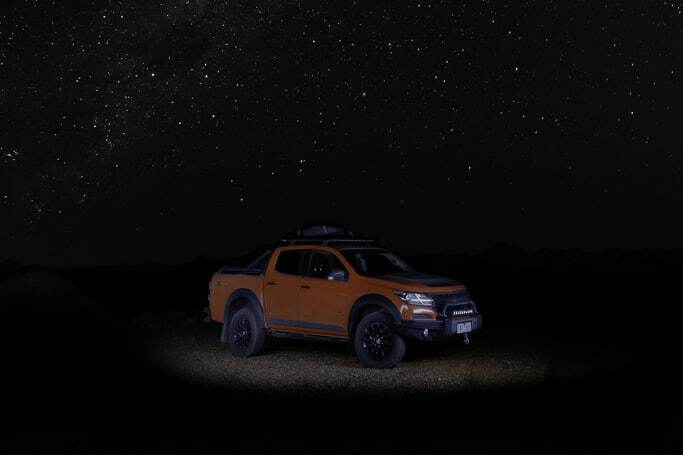 If you plan to cover hundreds of kilometres of loose gravel roads, then the Holden Colorado Z71 Xtreme is a great option. Not only were small bumps dealt with well - the suspension managed big compressions at higher speeds with ease, and while the rear seat passengers were often bounced around a bit more than those up front, we weren’t travelling at ‘caravan’ speeds. The steering is great on loose surfaces, too, no doubt aided by the A/T tyres on the Xtreme - we had no issues with front-end grip, but like all live-axle rear utes, the back end can swivel and pivot a bit. Because of the number of sharp rocks prevalent on these sorts of roads, the tyre-pressure-monitoring system was a very handy item to have, too - and it’s configurable, depending on your load. The steering is great on loose surfaces. The engine and transmission were at home at higher speeds, with the gearbox settling sixth and only calling upon lower gears when truly necessary. It offers good linear power delivery and the gearbox exhibits good, clean, smart shifts. To be honest, it was hard to pick the difference between the Xtreme and the other Colorado models we also drove on this trip - which is good. But the biggest giveaway was the very noisy roof platform system, which howled at speeds above about 90km/h. And - to the naked ear, at least - the tyres offered up just a little more noise than the Bridgestone Dueler H/T rubber on the other models, but that’s to be expected of a more aggressive tread pattern. As for a more serious off-road review, the terrain out near Coober Pedy isn’t the most challenging. We did a short, semi-sandy loop outside of town, which included some low-speed ascents and descents, and the Colorado Z71 Xtreme handled it all with relative ease. 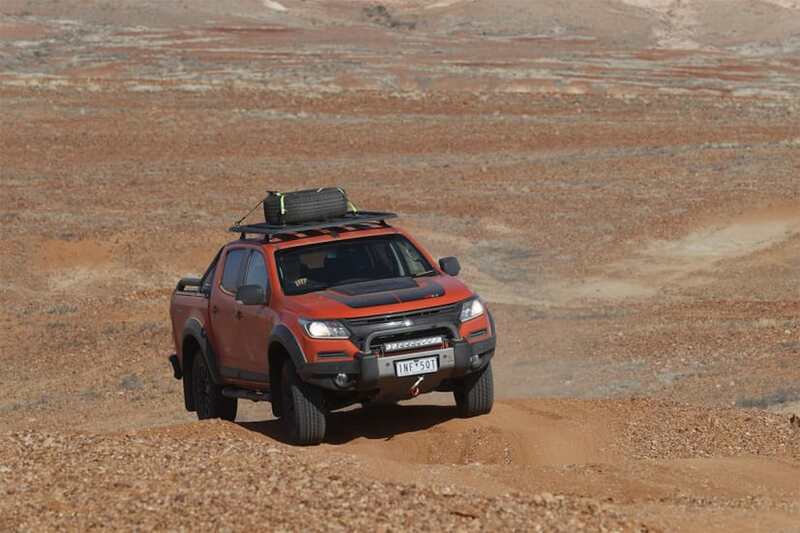 Traction was fine, and in 4H there was no trouble dealing with the hard-packed sand under its A/T tyres. 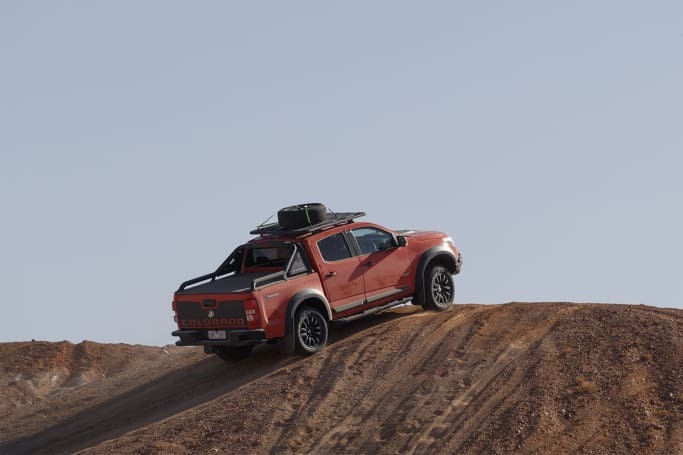 There is no rear diff lock, though, and that could mean a little more money to spend if you plan to keep up on the more serious off-road stuff that some competitor utes with differential locks can handle. The ground clearance isn’t as good as some other utes, at 215mm, but the under-body protection did its job. The ground clearance isn’t as good as some other utes, at 215mm, but the under-body protection did its job. One thing to note is that the Holden’s front bash plate is rated, but it is only 2.6mm thick - the HiLux Rugged X plate is 5mm thick! As for the all-important angles: the approach angle is 28 degrees (increasing to 33 deg at the inner edge of the front tyre, and 36 deg at the outer edge, due to the taper of the front bar), while the departure and ramp-over angles are 22 deg. Our test didn’t involve any towing, so we can’t give you a towing review impression. The Holden Colorado range achieved the maximum five-star ANCAP safety rating when it was tested in 2016. And while the Colorado Z71 Xtreme has some pretty good safety gear, it isn’t at the head of the class. This version, for instance, gets a forward collision warning system, plus it has lane departure warning (not lane keeping assist). There’s no auto emergency braking (AEB) or blind-spot monitoring as you’ll find in utes like the Mercedes-Benz X-Class and even the much more affordable SsangYong Musso. But for off-roaders the inherent safety of things such as a heavy-duty steel front bar and a bright LED light bar are notable additions. 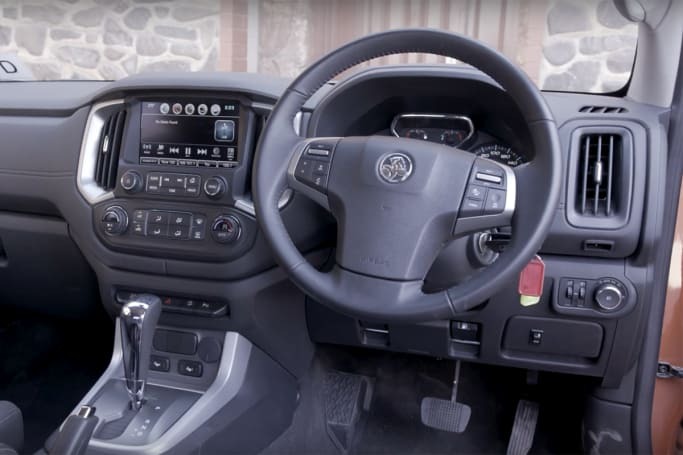 For less adventurous duties you can rely on the reversing camera, plus it has front and rear parking sensors (which are nicely integrated into the respective bars). The electronic stability control includes trailer sway control and hill descent control. There are six airbags (dual front, front side and full-length curtain), and the back seat has dual outboard ISOFIX child-seat anchors plus top tethers. Holden’s range-wide five-year unlimited kilometre warranty is applicable to the Colorado range, and that’s good news. The remainder is transferable to the next owner if you decide to move on, too. The Colorado range persists with the annoyingly short service intervals of nine months/15,000km. That means you’ll be visiting the dealer for maintenance a bit more than some competitors which require annual servicing - the Navara, for instance, only needs servicing every 12 months/20,000km. At least the costs are reasonable: the average cost per visit over five years works out at about $422. Read our full Holden capped price servicing story here. 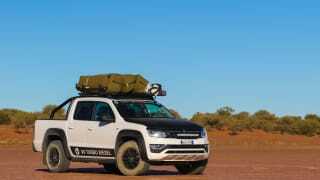 The Holden Colorado Z71 Xtreme is a good open-road tourer, and the addition of all the extra gear definitely has plenty of potential customers. 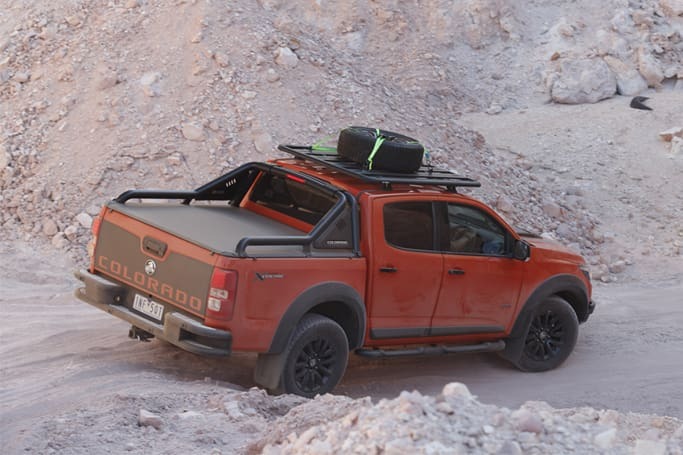 But the cost is pretty high, and I’d personally be tempted by a more affordable Colorado model fitted with a few of the accessories in the brand’s extensive parts catalogue. Do you rate the Xtreme as an off-road machine? Tell us what you think in the comments section below.